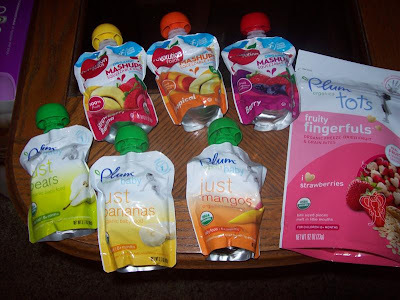 I was excited to receive these samples from Plum Organics for review! They sell a bunch of treats for babies and toddlers. Yes I am 20 years old but I still like to eat these kind of treats sometimes! I tried a bunch of their mashed fruit from their "just" line. My favorite was the just mangos! They are only 40 calories which made a nice little afternoon snack. They are organic and 100% fruit puree. There are no added colors, sugar, or juice. I was also sent the fruity fingerfuls for toddlers which is cereal with added pieces of fruit. I got the kind with the freeze dried strawberries. It was very tasty. I really like this whole line of products and would recommend them to people of any age (even adults like me). Thanks Plum Organics.